on John L's MacConkey-based "ET Agar." Until mid-2014, I taught the Microbiology 102 laboratory course at UW-Madison (formerly "Bacteriology 102"), and we informed the students at the start that we are working with the relatively small universe of bacterial species that are "easy to grow" and, for that matter, easy to test in the laboratory. Far from being of limited consequence, they are the type of organism that (depending on the particular species) can proliferate in food (causing spoilage), the general environment (participating in various levels of biodegradation), and us (causing disease), and they can also "contaminate" things in general. These organisms can be readily isolated from natural samples and food products as we will find out from time to time. What we learn from these organisms can apply to bacteria in general – including those that cannot be cultured in a lab at all. They can also serve as models for processes that occur in higher forms of life such as us. Unlike other introductory lab courses, we go beyond the usual respiring and fermenting organisms and also study phototrophs, specifically the ubiquitous purple non-sulfur photosynthetic bacteria. We are filling in "the big picture" as one sees as the course progresses. We do not wish to be memorizing a bunch of trivia that we can forget about after each quiz. And we will not put silly "politics" before correct teaching of the subject matter. Check out our pages on the subject of dilution theory and note that the same simple principles apply universally. The same applies to pH-based differential media. As an example, the effects of aerobic deamination in differential media should not have to wait to be suddenly explained when the course gets to KIA (or TSI), as that process shows its effect in organic media throughout the semester. Use of correct terminology is important. For example, we would never want to go out into the world and equate "strain" with "species" or vice-versa. In summary, the following list of general bacteriology topic pages form the substance of www.jlindquist.com/generalmicro, and most were originally at www.bact.wisc.edu way back in the 1900s. These pages are not meant to serve or be represented as a Bacteriology/Microbiology 102 site which are distinguished here. 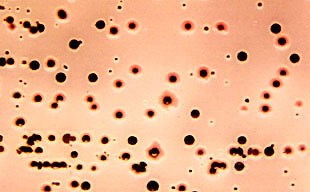 The Types of Bacteria site is filled with updated information about helpful and harmful microbes. The Differences Between Bacteria and Viruses are explained on this page which also includes a list of links to useful information that one should know about bacteria and viruses. Microbes.info – The Microbiology Info Portal. Selected Microbial Groups and the Enrichment & Isolation Experiments are listed in detail on the Bacteriological Site Outline. Included among the pages are the following: Explanation of the General Concept of Enrichment and Isolation, Salmonella Nomenclature, Bioluminescent Bacteria, the Purple Non-Sulfur Photosynthetic Bacteria and Bacillus. In these pages we review some isolation methods which are workable in any introductory microbiology lab course. With that in mind, we are no longer in the business of sending out cultures. Moving Soon from the Old Bacteriology 102 Site to Here: Growth Curves, Colony-Forming Unit (what it is), Dichotomous Keys, Flow Charts and Tables, Microscope Guides and Scientific Notation. There is a matter of confusion in the old Bact. 102 Growth Curve page which will be straightened out before it is moved here. As absorbance is already a logarithmic value, it makes no sense to plot it along with CFU/ml on semi-log paper (as shown in the figure), unless one indicates it is only there for convenience to demonstrate a general relationship with cell density. Certainly one would not be able to determine growth rate and generation time from an absorbance curve so posted. On linear paper, you will get a correct correlation between the log of CFUs/ml and the straight absorbance values during the exponential phase of growth. Until the end of Spring Semester, 2014, the Microbiology 102 Site at www.jlindquist.com/microbiology102 carried on the mission of the aforementioned archived/retired Bacteriology 102 Site in being a course supplement. The home page for its last semester is here, and the remaining pages which concern subject matter are updated as necessary. Draining the web of its cesspool of piracy and plagiarism is long overdue. There exist certain publicly-funded .edu sites which copy old editions (circa 2000) of many of the above-listed pages without authorization. Improvements and corrections are not reflected – nor are changes in our teaching methods and course content. Links are broken and images are missing, and an unauthorized copy of my home page is over a decade out of date. Unfortunately these pages rank high with search engines, but happily the sites by these identity thief-wannabes are easily detected as just described. Page last modified on 5/26/18 at 7:00 PM, CDT.